With native 4K input and output, the E2 provides impressive pixel processing power. Whether native or scaled inputs, two connectors or four, this HDCP-compliant system manages it all. 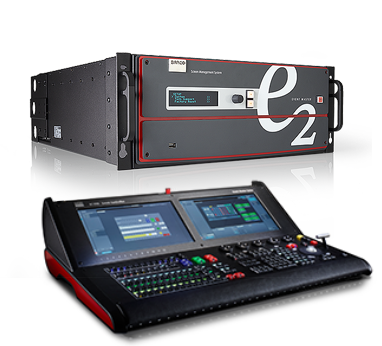 With 28 inputs and 14 outputs (eight PGM, two Multi-viewer and four scaled Aux outputs), the E2 system offers full show control, including eight independent PIP mixers and a dedicated Multiviewer. Thanks to its linkable chassis, it can easily expand beyond these eight outputs without the need for additional external processing and routing to distribute the signals. And as its inputs and layers can also be extended, the E2 is even capable of managing a blend of up to 32 4K projectors. The E2 comes with a straightforward cross-platform user interface that provides touchscreen ergonomics. As the presets are stored on the chassis it enables easy control via third-party systems. Multiple users can control the system simultaneously, and the API allows third-party developers to create custom control programs and interfaces. Thanks to its modular design, users can simply add a new input or output card to support future signal interfaces. This modularity also ensures great serviceability, as users can easily swap a specific input or output card in the case of damage, without needing to ship or replace the entire box. Designed for the live event industry, the rugged E2 features a steel chassis that’s able to withstand the challenging conditions of life on the road. What’s more, it offers screen control in a compact form factor of only four rack units, which makes it easy to ship and install. 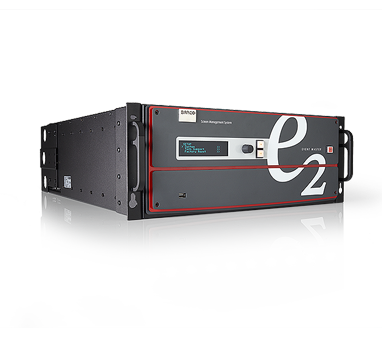 And thanks to its modular cards and dual redundant power supplies, the E2 is extremely reliable and easy to service in the field.